Confession time. My name is Stacy and I am the daughter of junkers. Every weekend we were on the road to a flea market, swap meet, antique car show, or some other event where junking was also possible. My Mom collected California Indian baskets, Navajo rugs and blankets, and pueblo pottery. My Dad collected everything else. Seriously everything. Peddle cars, Buddy L trucks, Ford trucks and cars, slot machines, gas pump heads, enamel advertising signs, black powder rifles, pocket watches with steam trains on the back, and on and on. When I moved away to college I didn’t take the junking bug with me, or maybe it was just dormant. I collected floaty pens and books from the art museums that I visited, but not much else. I didn’t really decorate with antiques until I started receiving things from my great grandmother and my grandparents. But still much of that went in to boxes in the garage. 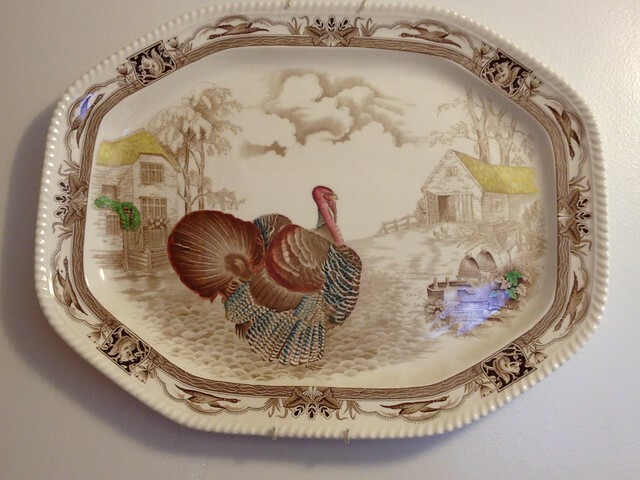 I hung my grandmother’s turkey platter, The Barnyard King. 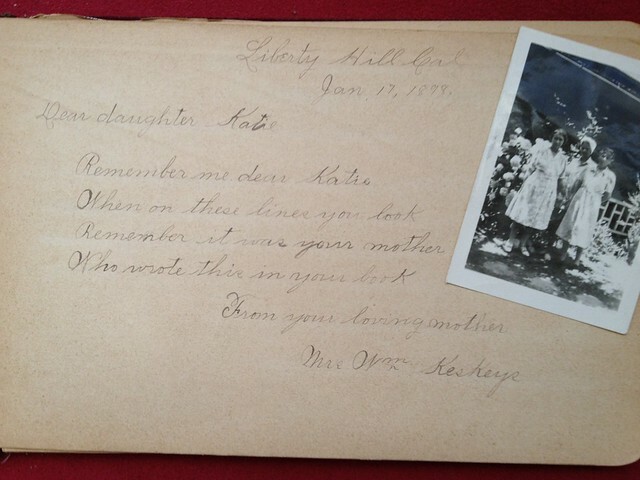 And I love having my great grandmother’s autograph book. The family treasures made me start to appreciate the trips we took, the people we met and the esoteric knowledge that was still lodged in my brain. 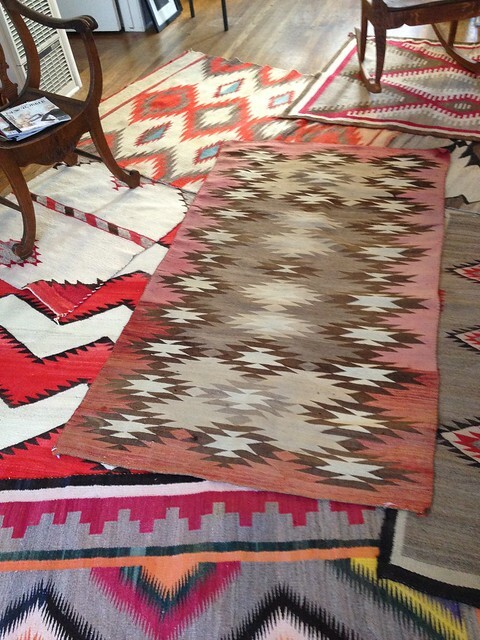 My French-made Turkish-style rug was nice but did not compliment my 1930’s Jo Mora Cowboys and Indians prints (from my grandparents garage). I was visiting Mom and asked if she still had the Navajo rugs rolled up in the basement and if she didn’t mind I’d like one for my floor. She had started collecting in the late 1950s and by the early ’90s she was ready to move on. She said I couldn’t have just one, I had to take all that were left. Several trips up and down the basement stairs and the backseat of by vintage Prius was filled with rugs wrapped in brown paper. Last Sunday after Stephanie and I returned from the Sunset swap meet and our trip to Sally Loo’s I decided to unwrap the rugs and see if there was one I might want in the house. But I wanted all twenty five! Every one I unwrapped was my new favorite. I narrowed it down to eight on the living room floor and one on a chair. And one in the hall and two in my bedroom. Each one is a work of art and I was having trouble with the idea of walking on them. But Mom said they a made for using and can’t be enjoyed while rolled in brown paper. So I will use them and enjoy. I’m sure my brother and I complained about our travels. We wanted a ‘normal’ house with ‘normal ‘furniture from ‘normal’ stores. And maybe even ‘normal’ parents. We were crazy. Thanks for the travels and priceless times Mom and Dad. Now every time I open my front door I remember another junking adventure.